It is high time for businesses to go online for their products and services. If you are a product based company, you would need an e-commerce platform to start with. But then again, the industry is filled with multiple options to choose from, and if you are new, it can be pretty overwhelming. However, we are here today to help you decide on the best e-commerce platform you can have for your business. 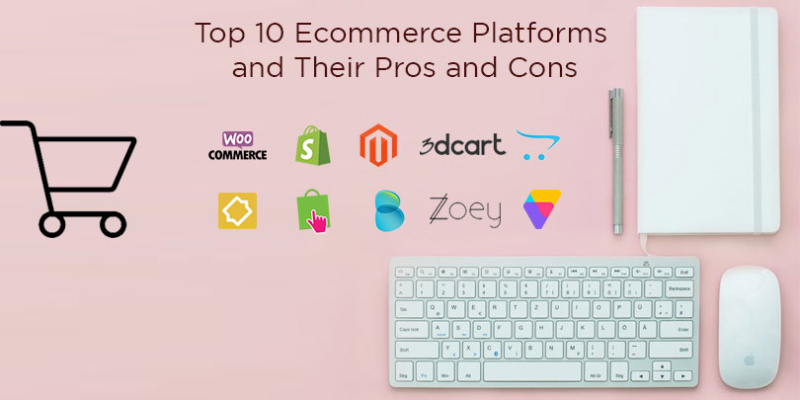 Just explore here Top 10 E-commerce Platforms with Their Pros and Cons. WooCommerce is one of the most popular e-commerce plugins globally. Today, it powers nearly 40% of the web’s e-commerce stores. It provides business owners with highly customizable options for both appearance and functionality of the store. Free plugin as well as easy to use. Use any WordPress theme (thousands to choose from). Built-in payments via PayPal and Stripe, while also accepting bank transfers and cash on delivery payments. Unlimited products and product categories. Multiple other plugins are available. You have total control over your data. Offers plugins to better optimize for SEO. You have to pay third-party sites to run your e-commerce stores such as paying for hosting, SSL certificate and domain. The process of setting it may take hours. First, you have to get a domain name, then install WordPress and then install a theme and finally install the WooCommerce plugin. File storage is limited by your web host. Unlike WooCommerce, Shopify is a standalone eCommerce platform. Here, you don’t have to host your site anywhere else to use it. According to Google trends, Shopify is the most popular choice of e-commerce platform in the U.S. Cost-effective pricing for new businesses. Other features include unlimited file storage, social media integration, unlimited number of products, blog module, product reports and more. Can use it online and offline. Allows for various payment options, i.e., PayPal, Stripe, bank deposits and cash on delivery. Superior customer care, 24/7 access to a customer adviser. Few free store templates. Other themes can run as high as $180. Advanced Shopify option costs $299/month. Shopify controls your e-commerce store and site’s data instead of you. You can customize even more but with additional costs. BigCommerce e-commerce platform claims their merchants grow at a rate of 28%, which is twice the growth rate of any order e-commerce business in the industry. It works with some of the big brands such as Camelback and Toyota, making it a highly sought after platform. Clear dashboard and direction to quickly build your site in a few minutes. It Offers unlimited products, bandwidth and staff accounts. It Provides multiple built-in features. Receive customer support through phone, email, live chat or the forum. Nearly all Fortune-500 companies use Magento as their eCommerce platform because it is highly responsive and scalable. Magento is a popular choice of platform for both start-ups and established companies. Customization is free but complicated. You need to hire professional developers for the job. You have to find and pay for a hosting provider and domain name. Doesn’t offer access to a 24/7 support person. 3Dcart is an easy-to-use, all-in-one eCommerce platform. While it comes with pretty good customization options for more experienced developers, it’s interface doesn’t leave the beginners behind. Unlike some others, 3Dcart comes with built-in mobile selling so you can sell through social sites and connect your store to sites like eBay, Shopzilla, and Amazon. Even the entry-level account is quite feature-rich. Many free templates, each of which are well designed, moreover you have many more paid templates. Intuitive, user interface that is suitable for both beginners and experienced. It is customizable but less than many of its competitors. You may need a developer’s help for the job. Many features are available only on upgraded and higher plans. Prestashop is an open source e-commerce platform that users can have hosted in the cloud or downloaded from the Prestashop website. The system is backed by a large community with over 800,000 members who are working to keep Prestashop exclusively dedicated to open source e-commerce. Big support groups and communities to increase its features. The Admin panel is flexible and easy to handle. It increases the loading speed of the online store. It is easy to change an old theme into a new one. This is perfect for beginners and intermediate online shop owners. Most modules required for a fully functional shopping cart website are highly priced. PrestaShop is suitable for small to medium-sized businesses but creates doubt when it comes to a full-scale shopping store. No opportunity to input attributes and cross-sell products. The default skin and product catalogue need improvement: they are not as professionally designed as compared with other solutions. It offers users a comprehensive set of features. New users would go through an easy learning curve, which means they could set up as well as start using OpenCart quite fast. The interfaces offered by OpenCart are very straightforward and simple. OpenCart comes with comprehensive documentation thereby making initial set-up easier. Cost effective price even for small businesses. Lags in performance and features, unless you opt for additional plugins. OpenCart is not very easy to customize, which might be constricting for many businesses. Caching is not provided by OpenCart, as well as it must be added using an extension for improving performance. If you are in the market for an easy to use, yet powerful e-commerce solution then Zoey Commerce is the perfect solution for you. Built on the popular Magento platform, Zoey Commerce is a very slick solution that makes the whole experience of building an online store effortlessly. Zoey provides hosting with e-commerce builder so there’s no need to look elsewhere. It provides easy-to-use and intuitive features. Zoey e-commerce builder is not cost-effective even for smaller companies. It provides little customization plans for basic users. For most of the part, you need programming experience. Volusion’s key selling point is its affordability. New business owners can set-up a full online store and start selling up to 100 products for just $15/month. Demands coding knowledge from online shop creators. LemonStand is specifically designed for fast-growing companies, whereas it is well-suited for businesses who want code access and options for full customization. However, it is not meant for beginners in the e-commerce industry. Highly-customizable. You’re not limited by your themes. Finding the best e-commerce platform for your store depends on your budget, programming skills as well as business needs. However, on the competitive side, Shopify and WooCommerce are the most popular choice of e-commerce platform today.